Welcome back to this week’s edition of “Another movie-musical that disappointments me!” Today’s show features intense bleaching of dark themes, feather-light songs, and repressed homosexuality turned not-so repressed. It’s been a while since I’ve rushed a show that had a long line, but I wasn’t surprised there was one for this show. Billy Elliot sells its student rush tickets two hours prior to the performance for $41.50, and officially bests Shrek the Musical for the most expensive rush ticket I’ve heard of. Since Billy sells nearly all of its tickets each week, I suppose it’s pride that inspires the producers to set the rush rate at this price. To put this in perspective, $41.50 for a Broadway show is not a bad deal. But since we’re talking student discounts, the reason such a practice was put into place was so that students with limited funds could experience Broadway for a cheaper rate. Rear mezzanine seats can be bought for this price at nearly any Broadway show. The lobby of the Imperial Theatre is quite large, so the rush line forms inside, which always makes me happy. I arrived just a few minutes before 5 p.m., and just beat a large group of people that tagged on behind me. Anyone planning on rushing this would be well advised to arrive between 4 and 4:30 p.m. Tickets can be purchased with credit or debit and each person may receive two tickets. The seats are nothing special – rear mezzanine for the performance I attended. The Imperial Theatre is gigantic (it seats 1,421) and the facial expressions of the actors weren’t too easy to make out. Billy Elliot is everything I hate about musicals. It takes moments with the potential to be subtle and touching and blows it up to the size of a birthday party on fire. 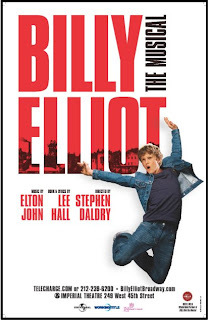 Rather than using the arena of musical theater to create something abstract and out of the box, the creators of Billy Elliot have used it as a vehicle to dumb down a beautiful story for a less accepting audience. 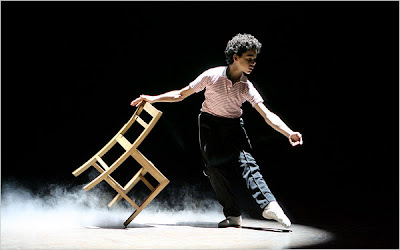 Based on the fantastic 2000 film by Stephen Daldry, the director returns to helm the stage production of a boy longing to be trained in ballet amidst the volcanic backdrop of an English town in financial ruin due to the mining strike of 1984. I want to start off with something positive. At my performance, the role of Billy was played by David Alvarez. The young actor was phenomenal. There was pain in his eyes (yes, I could even tell from my seat) and hope in his movements. His dancing at times became so intense and complicated (thanks to complex choreography by Peter Darling) that I began to hold my breath. David, you are certainly not the problem with this show. Keep dancing, kid! My complaint is that tiny gems of the movie were exploited in the musical in attempts to evoke more brilliance. I’m sorry, but I’m a student of the old school of thought that less is more. A feeble, senile grandma with few (but poignant) lines in the movie becomes a firecracker that gets an overblown song (played here by Carole Shelley). Not as charming. An emotionally limited ballet instructor (Haydn Gwynne) who eventually hands Billy the key to his future becomes an exaggerated shrew who is then unable to make the subtle parting-of-the-ways moment touching. Perhaps most disappointing was the role of Michael, Billy’s closest friend who keeps his homosexuality tightly locked away until he’s alone and able to dress up in his sister’s clothes. What was a subtle but intense portrayal of repressed nature in the film became a ridiculous, unrealistic charade on stage (at my performance, played by France Dolce). The frock scene (which naturally gets its own musical number in the show) is called “Expressing Yourself,” and has Billy and Michael pulling out every cheesy Broadway cliche short of top hats and black canes. Ensemble members dance around as gigantic trousers and house frocks (think the “Be Our Guest” sequence from Beauty and the Beast, only with garments). High expectations come from the musical team of Elton John and Lee Hall (music and lyrics, respectively). I wanted so much to like the music, but I just found it to be forgettable. The numbers performed by the miners are fairly strong and evoke a slight Evita feel. But otherwise, I didn’t think twice about the music after leaving the show. The only well-done scenes are “Angry Dance,” the Swan Lake dance sequence, and “Electricity.” And not to bring down the few things I liked about the show, but the point of Billy’s character is that dance is the only method in which he can express himself. Speaking is supposed to be painful for him. In the movie, he uses “electricity,” one word to describe how he feels when he dances. Here, he takes that word and builds an entire song around it with a whole bunch of words. When it was unaccompanied, it carried more weight than it does when armed with three and a half minutes of lyrics and orchestration. As I’ve found with so many of this movie-musicals, I’m better off popping in the DVD and enjoying the original incarnation. So maybe I’m going to do what’s best for me and just stop seeing these types of shows… Wait, what was that? Aaron Tveit, one of the best actors in my favorite new musical Next to Normal (review coming soon), is starring in the upcoming Broadway production of Catch Me If You Can? Are they going to have a rush? Just saw it on Broadway yesterday (4/18/10) and hated it!